Greetings! Let's talk about heraldry. The purposes of heraldry are many: battlefield identification, historical symbolism, and esprit de manse. Though there are many rules and standards in European heraldry, many of them are loosely followed or adapted to the needs of the commissioning house. Other rules are considered law, and misrepresentation of one's house and arms a crime. In Elyria, we know only a little about the standards and rules of heraldry (Source: IRC Transcript). In this guide I will discuss in general the rules from a European perspective, and I will note along the way where the few Elyrian specifics come into play. As with all my guides, I hope this will become in some ways a group effort--please respond in comments if you see something in error or unclear, or if you have more current information on Elyrian heraldry that I haven't seen. 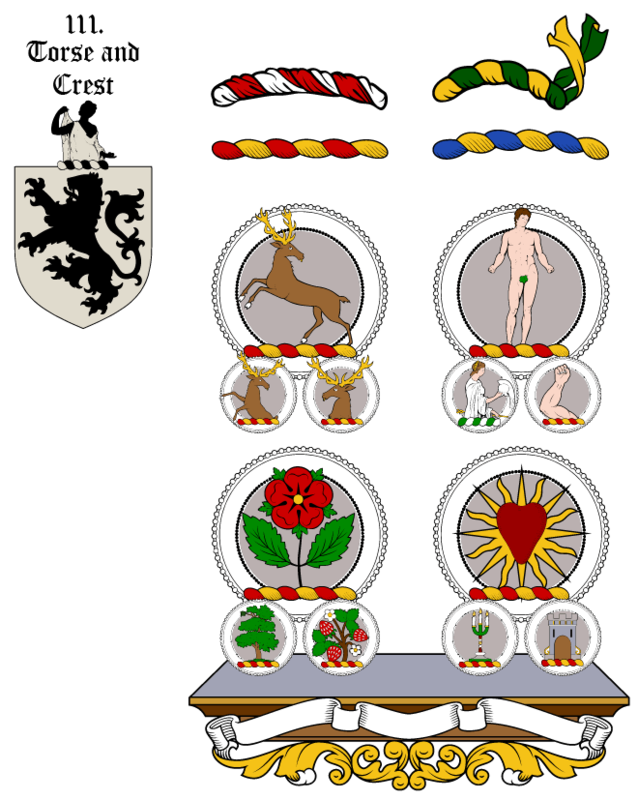 The foundation of all heraldic arms is the escutcheon or shield. The base color of the escutcheon is called the field. This color can be one of three types: tincture, metal, and fur. The field can be divided or may bear an ordinary, and is also colored according to one of the three types. European heraldry has a rule here: one cannot place a division or ordinary from one color type atop the field of the same type. For example, one cannot place a silver division atop a gold field, as these are both metals. Finally, the boundary between the field and division/ordinary may be modified in several ways, as shown above. In Elyria: the gentry are allowed to represent themselves with an escutcheon and charge (see below). We do not yet know if rules of tincture exist, or if the categories of color are the same. The charge is often erroneously called a "crest." The charge is usually a symbol or symbols closely associated with the aesthetic, values, or history of the house it represents. These range from animals both mythical and ordinary, tools, weapons, celestial bodies, structures, geometric designs or other objects without limit. Many believe a charge to hold specific symbolic meaning in accordance with the rules of heraldry, but in fact the meaning of a charge varies from culture to culture or even house to house. A lion could symbolize bravery in battle, just rulership, royal lineage or even the opposite of these depending on its pose or size and relation to other charges. Single charges are typically centered on the shield, though other arrangements are possible, including surmounting one symbol atop another. These alternate arrangements are almost always symmetrical and balanced. A charge can be colored proper (as one might find it in life) or according to the three color types mentioned above, and divided similarly to an escutcheon. Rules of tincture do not typically apply to a charge. In Elyria: We will have a limited selection of charges which are appropriate to the tribal culture, region or religion from which they originate. Multiple charges may be placed on an escutcheon similarly to European heraldry. The crest is a symbolic object situated above the escutcheon and held by the torse, a twisted or braided piece of cloth. The torse usually matches the colors of the escutchon, but not always. The crest itself can be as widely varied as the charge. Commonly, the crest is flora, fauna or a person (or part of a person--most especially a human arm), or a structure or other symbol. If a helm is present in the coat of arms, the torse and crest sit atop it. In Elyria: aristocracy gain the right to bear a torse and crest. As with the charges, expect the available symbols to be commensurate with the culture and region from which they originate. The helm is situated above the shield and signifies a militant house. Though there are many cultural differences, in general nobility have an open or barred visor and the helms of royalty are front-facing. All other classes have closed helms facing to the viewer's left. An exception to this is when two helms are present (signifying two houses merged through marriage). In such a case, both helms face inward to the center. In Elyria: Barons may have access to helms. Otherwise this feature is restricted to ducal and royal arms. Open or barred helms signify nobility. It is yet unknown if facing will matter. The mantle is a part of a knight's garb layered under the helm to cover and protect the gaps and joins at the neck and shoulders. As a result, the mantle is often torn and tattered in combat. 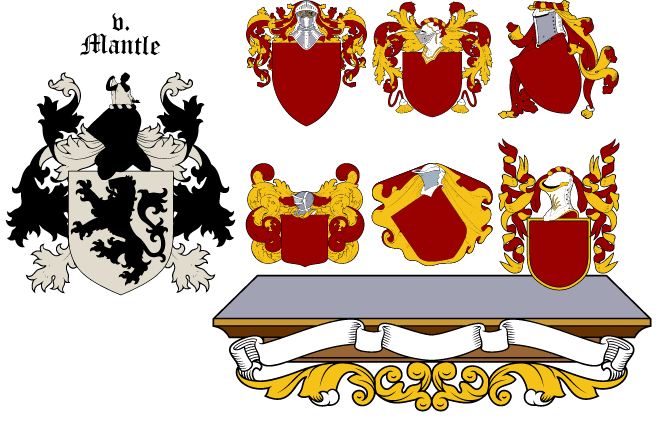 In heraldic arms, the mantle is most often portrayed in such a manner, though decorative and heavily stylized. Members of the clergy who also held lands and title would represent their arms with an uncut mantle, to show restraint from violence. In Elyria: Dukes and kings may wear a mantle on their arms. 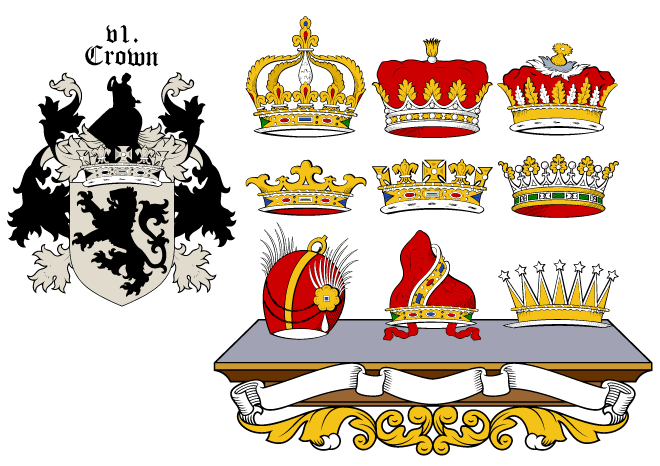 The crown or coronet is placed on the arms of titled families, usually atop the escutcheon below the helm or crest (if present). There are many types of crowns and coronets for each culture and strata of class throughout Europe, from knights to emperors. In Elyria: Only kings may display a crown on their arms. NOTE: I seem to be missing an image for supporters! I will correct this omission on future updates. Supporters are symbolic elements similar to the charge and crest. These are arrayed on either side of the escutchon, usually holding or otherwise supporting it. While animals are the most common supporter, people or structures are sometimes used. Also, a single supporter can be placed behind the shield as in the eagle of the US Coat of Arms. In Elyria: Supporters are granted to nobility. As with the charge and crest, expect the symbols available to reflect one's culture or region. Is it true that only pompous snobs use a jousting helmet for their helm? As a huge fan of heraldry and it's importance, I approve of this thread. 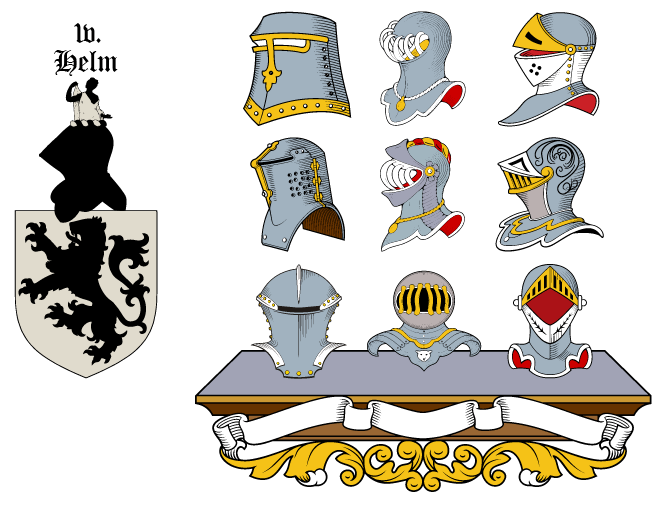 In European heraldry, knights and aristocrats wore tilting helms. The true pompous snobs among the nobility wore barred helms or helms with open visors. Nicely done. I only had a vague understanding of heraldry before. Thanks for clearing it all up! I was unaware that we knew anything about Elyrian heraldry rules already. Has it been discussed before? I must say this is a great post. I've always wondered about the rules of heraldry. So will we be able to add things to our crest if we raise in rank? Likewise, if a King falls from grace will they be required to remove their crown? *EDIT and now that I think about it even house heraldry changed from person to person based on marriages with other houses. How frequent do we expect to be able to change our house heraldry? I presume you could change it as often as you want, as long as you pay the person(s) involved to alter it on any clothing, armor, documents, etc etc that you have produced. So it's more of a financial blocker. As to "rules" about what you can do, I assume it's only really player policed rather than being restricted in game. So you could put whatever you want on your heraldry, and if someone else takes offense and attacks you over it, that's your problem. I think that would be awesome, maybe similarly to how the server deals with maps. AKA if enough maps call a city X the cities name is now X. But a followup to that would be what would stop anyone from adding duke level things to their heraldry as a commoner? would it be a sever wide implicit law? Thinking pledge packages and how the higher you go you get access to more things. Again I think self policing may be the best way. If you're a lowly farmer that wants to spend the money and resources to get your own crest then go for it, but if your Count/Duke/King doesn't like what you've done expect higher taxes, evictions, arrests, etc. I think having it more freeform in this fashion both makes it easier for the devs to create, and opens up more player driven stories. (12:31:23 AM) Caspian: Polite: Want feedback? (12:31:33 AM) Polite: Sure. I can take it Caspian. Crush me. (12:32:03 AM) Persephone: Break him down and I'll build him back up. (12:33:12 AM) Caspian: 1. Remove the drapery/mantling. (12:33:12 AM) Caspian: 4. The field is fine with the red/white, but it's unlikely we'll have that woman's face for you. So maybe pick a simpler symbol. (12:33:53 AM) Caspian: Did my points 1 through 4 come through? (12:33:58 AM) Caspian: Or did IRC kill them? (12:33:59 AM) Polite: They sure did. (12:34:02 AM) Persephone: They exist! (12:34:11 AM) Polite: I like coronets but I feel you on that helm point. (12:34:40 AM) Polite: I figured on the woman's face. ( 12:34:42 AM) Caspian: "Open or barred helmet, reserved for members of the nobility"
(12:34:50 AM) Caspian: "Closed or tilting helm, used by medieval knights, also adopted by English esquires and gentlemen, as well as on burgher arms"
(12:35:10 AM) Caspian: So you'd want an open or barred helmet. 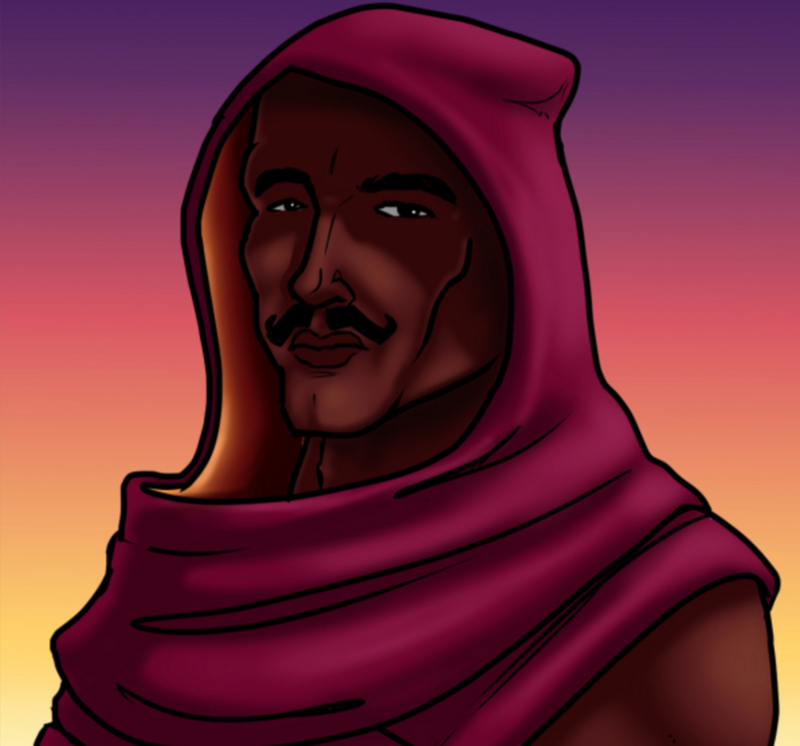 (12:35:30 AM) Caspian: We may grant closed helms to Barons. (12:35:40 AM) Polite: Interesting. I'm taking notes. (12:36:18 AM) Caspian: The plan now is for Mayors to just get torse & crest, barons to get closed helms after being appointed a baron by their duke. And then Dukes getting the open/barred helmet and mantling. (12:37:20 AM) Caspian: Also, a sun and moon would be a great charge for your field. (12:37:56 AM) Caspian: I recommend doing a crescent moon/sun combination. (12:38:06 AM) Caspian: Maybe white / black or another color contrast. (12:38:21 AM) Caspian: Especially if you plan to go as Qindred. (12:38:31 AM) Caspian: The symbolism of Luna / Angelica would be pretty neat. (12:39:08 AM) Polite: Various sects of the cult believe she was inspired by Luna. Some think she was inspired by Angelica. (12:39:22 AM) Polite: Some more heretical ones whisper the Two Fold Goddess told her to bring order to the world, etc. (12:42:16 AM) Ircai: woah what is this? (12:42:25 AM) Polite: Thanks so much Casp. (12:42:31 AM) Caspian: Suggestions/ideas for Polite. (12:42:48 AM) Caspian: On ways to improve his Coat of Arms to increase the likelihood of getting something close to his design after launch. (12:42:49 AM) Ircai: im using my actual family coat of arms as inspiration :D (12:42:52 AM) Polite: Now I can make a tentative "CoE Ready" version. (12:43:32 AM) Caspian: Ircai: What rank are you? (12:43:47 AM) Caspian: Ok. The same applies for you. (12:44:02 AM) Caspian: Field, Supporters, Torese & Crest, Helm & Mantle. (12:44:06 AM) *Persephone countess low five. (12:44:31 AM) Caspian: Until she works her way up to Duchess!! (12:45:15 AM) Persephone: This gal is all about HARD WORK and DEDICATION and OVERTHROWING POLITE IN A MOMENT OF WEAKNESS. (12:45:30 AM) Polite: Wait what was that about overthrowing? (12:45:36 AM) Persephone: Yea I'm gonna be playing as Polite's lil sister. (12:50:12 AM) Ircai: @Caspian since that pic is my reference to my heraldry design what do you refer to by field? (12:50:35 AM) Zenfyre left the room (quit: Ping timeout). (12:51:01 AM) Caspian: Ircai: The field is the contents of the shield. 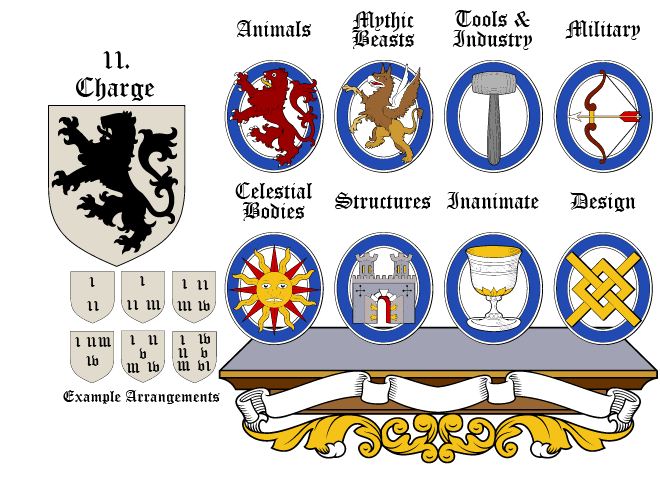 (12:51:13 AM) Caspian: What the diagram calls "shield elements"
(12:52:00 AM) Caspian: Also, that appears to be more or less fine for a Duke's Coat of Arms. (12:52:33 AM) Caspian: It's got all the elements a duke can have, and none it can't - except for the motto. (12:52:55 AM) Caspian: As to whether we make those supporters available, or that crest - that's hard to say. (12:53:09 AM) Caspian: But assuming we've got something similar, you should get pretty close. (12:53:40 AM) Polite: Ooh nice. (12:54:03 AM) Polite: Very nice! (12:58:07 AM) Ircai: iirc from the conversation the crest could present both or a degree or something? (12:58:29 AM) Caspian: Dukes don't wear crowns / coronets in CoE. (12:58:39 AM) Caspian: Use an open or gated helm. (12:58:55 AM) Caspian: The helm was the symbol of military combat. (12:59:06 AM) Polite: Good symbol for the Duke then. (12:59:19 AM) Caspian: Since Dukes are responsible for the defense of the realms, we use the helms to indicate the Duke's role of leader of the armies. (12:59:20 AM) Ircai: so the helm I use would be considerd a closed helm correct? (12:59:38 AM) Caspian: The one you linked before is a closed helm. (12:59:43 AM) Caspian: It's more for knights / barons. (01:00:26 AM) Caspian: Either of the left two are common for Duke. (01:00:30 AM) Caspian: The right two would be for Barons. (01:00:31 AM) Ircai: those are considered gated correct? (01:00:59 AM) Caspian: There are of course other styles. (01:01:34 AM) Ircai: are you aware of the movie A Knights Tale? (01:04:10 AM) Caspian: We'll have a couple to select from. (01:07:07 AM) Caspian: I'm off to bed. (01:07:11 AM) Caspian: Work tomorrow! (01:07:17 AM) Polite: Sleep well. (01:07:59 AM) Ircai: ok take care Caspian! (01:19:31 AM) Polite: Ooh nice. Do you happen to know from roughly when that IRC conversation took place? 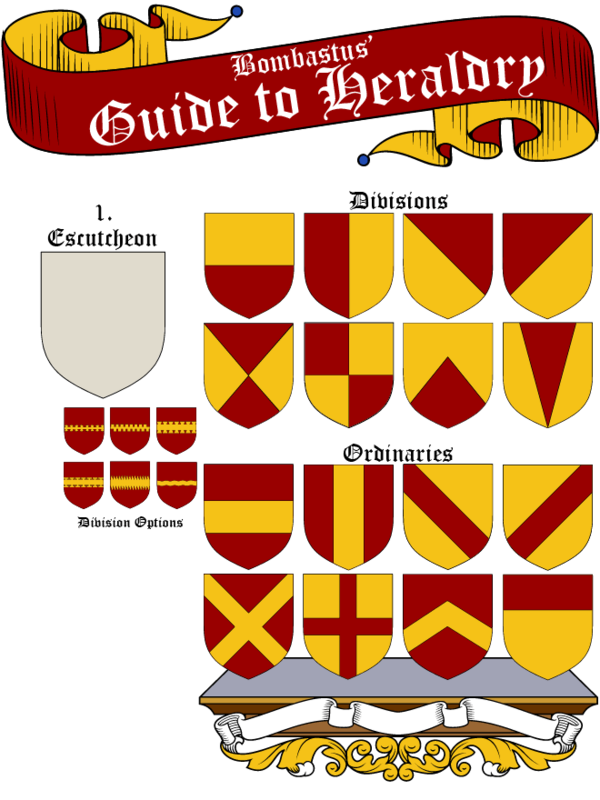 Now I want to go back and research how heraldic blazoning works, both to show off some knowledge in this thread and for future if I become a livery maker in game. "Or, a seven-point star above six five-point stars argent and gules, and on an embattled chief gules on a roundel argent a wheel Or and gules between two pegasi salient respectant argent." Doesn't help I'm going off the smaller picture I can see in the footer, but that should be enough to properly describe it, I think. Close! The division style is "potent counter potent." I blazon it: "Or, an estoille of seven points above six mullets of five points in an arc inverted gules, on a chief potent counter potent gules, a compass between two pegasi salient and countersalient proper"